Princeton starter Bill Stohr gave up three hits in this July 1990 game, on his way to his first pro victory, according to The Bluefield Daily Telegraph. Stohr's manager Eli Grba told The Daily Telegraph afterward he saw that Stohr win as an important stepping stone for the young man. "It was nice to see Billy Stohr get his feet wet," Grba told The Daily Telegraph. "Getting that first win under your belt, especially in your first year, is always a big thing." Stohr went on to record three more wins that year for a 4-7 overall record. He didn't record any more. That season at rookie Princeton proved the extent of his pro career. Stohr's career began and ended that year in 1990, signed by the Tigers as an undrafted free agent out of the University of West Georgia. He's also credited by his formal name, William Stohr. Stohr graduated high school from Dunwoody, Ga., where he made all-state in both baseball and football. He then played outfield, first base and pitcher at West Georgia for the full four years. 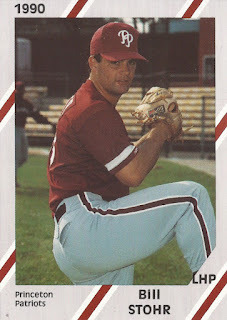 At West Georgia, Stohr took a loss in relief in an April 1988 contest. A year later, knocked in a run on a single in an April 1989 game. With the Tigers, the club assigned him to Princeton, a co-op team in the rookie Appalachian League. He recorded that 4-7 record and a 4.30 ERA. He also saved a game. He didn't return for a second season. Stohr soon went into coaching and teaching. He's coached multiple sports on the high school level, including football, baseball and softball. In 2017, he's serving as softball coach at Georgia's Hardaway High School. In August 2016, he spoke to The Columbus Ledger-Enquirer of taking over a team that had struggled after winning. "You have to build very slowly. You can't just expect everything to happen at once," Stohr told The Ledger-Enqiurer. "We need to keep getting a couple of better quality girls coming in year after year. Right now, we are a very young team, so our goal this year is to make it out of region."